"I think the arrow should wear off soon... A-ah! Wait a moment, please calm down!!" I'm Shinya, and this child is Cupid. There are some complicated circumstances; if we don't let it fall in love, we'll die. This has to do it! Cupid, take my strength. I'll shoot my most precious arrow! Passion Eros!! I think the arrow should wear off soon... A-ah! Wait a moment, please calm down!! Is it... even if I'm not tinkering with the heart anymore... is it okay? A male high school student who belongs to the archery club. He has the soul of a god who once presided over a certain world, giving him divine power almost like a curse that allows him to bend fate and causality in order to form a bond. That power is too much for a mere human to handle and if he were to grow too strong, Tokyo could vanish without a trace along with him. The Transient Cupid sticks with him and occasionally turns that power into arrows of light to expel some pent up energy. However, the arrows must hit someone to fulfill their duty. 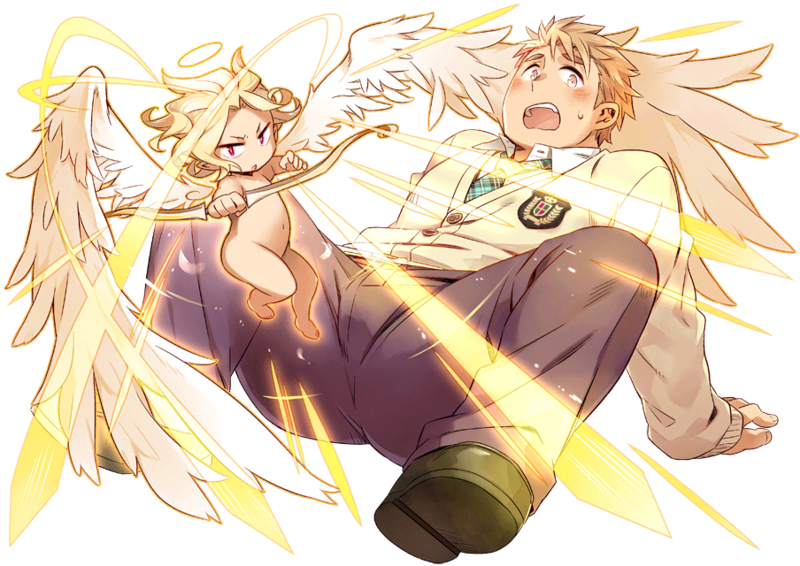 A gentle high school student and archery club member, accompanied by the cherubim Cupid. He has a soul that overlaps with a god existing within one of the parallel gate worlds, and the godly energy crosses that barrier, welling up in him. But if this extraordinary power accumulates too much in his ordinary human body it could destroy not only him, but Tokyo itself. Having taken a liking to Shinya, Cupid helps him out by periodically releasing this overflowing power in the form of light arrows. There is, unfortunately, the stipulation that the arrows cannot be fired aimlessly and must hit someone. Those shot through the soul by his arrows of light will love him blindly. He has no control over this effect and he dislikes gaining power over others without good reasons. Thus, he tries to turn the effects toward good and uses his arrows to shoot deities and demons who would cause harm. As a result, he is constantly at the center of some crazy rom-com or another, often with the fate of the world on the line. Those shot by Cupid's arrows temporarily become madly infatuated with Shinya. Although it must inevitably be done, he hates to play the heartbreaker to innocent strangers. His feelings are, "If it must be done, I can at least use this for a good cause." As such, he directs Cupid's arrows towards evil people who would do harm to others, distracting them from their misdeeds and using himself as bait to allow others to get away. As a result, the unlucky boy has somehow become entangled in a romantic comedy with the fate of the world at stake. His full name is Shinya Tennoji. He might have been gangbanged once. This page was last edited on 6 March 2019, at 12:58.